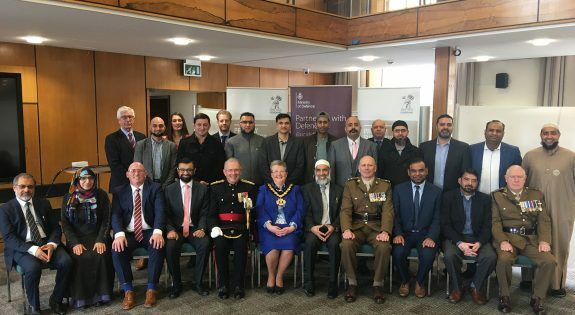 Sixteen Nottinghamshire based Muslim owned businesses have today (Thursday 21st March) pledged their support to the Armed Forces by signing the Armed Forces Covenant. This second covenant signing ceremony builds on the strong ties already established with the Karimia Institute and businesses from the wider Nottinghamshire Muslim community who signed the Covenant in December 2016. Lt Col Keith Spiers TD (ROYAL ANGLIAN) Head of UK Engagement East, joined the businessmen at the Nottingham County Council Offices where all put pen to paper to formally pledge their support. Her Majesty’s Deputy Lord-Lieutenant of Nottinghamshire, Col David Sneath TD DL, was also in attendance. Lt Col Keith Spiers said: “7th Infantry Brigade ‘the Desert Rats’ have a close relationship with the Karimia and many links with the Muslim community here in Nottingham. I must thank the 16 Muslim businesses signing the Covenant today, who join the 16 who signed two years ago, it is an excellent display of continued support for the Army and the Armed forces in the region”. “I am very pleased that Muslim business people are signing the Armed Forces covenant. This is an important statement which acknowledges, appreciates and values the work of our Armed Forces personnel. The least we can do as citizens is to reassure our soldiers that in time of their need we will stand by them and support them in every way. We Muslims are also making an important statement by signing the covenant: we are loyal citizens of Great Britain, our home country, which we love and care for. The signing of the covenant shows we are proud of the British Armed forces. “The reality is this, if we didn’t have a sense of safety and security we wouldn’t have any prosperity, and that safety and security is provided by our Armed Forces. “We are privileged here to have religious freedom, freedom to express our views and religious beliefs, and in order to live in a peaceful society we really do need a strong Armed Forces. Councillor Sue Saddington, Chairman of Nottingham County Council added: “Today, we are delighted that 16 businesses are undertaking the signing of the Armed Forces Covenant. "We Muslims are also making an important statement by signing the covenant: we are loyal citizens of Great Britain, our home country, which we love and care for. The signing of the covenant shows we are proud of the British Armed forces."